OTTAWA — B.C.’s shipbuilding and repair industry will get a shot of good news Thursday when the Harper government announces a five-year, $531-million contract extension to repair and upgrade Canada’s fleet of four diesel-electric submarines, The Vancouver Sun has learned. The contract, following a similar agreement struck in 2008, will protect roughly 200 jobs at the department of national defence’s Fleet Maintenance Facility in Esquimalt, according to a federal official. Another 200 jobs will be protected at locations elsewhere in Canada, he said. “This significant federal investment will support more than 400 high-quality jobs, improve the long-term sustainability of B.C.’s shipbuilding industry and provide the best tools for Canada’s sailors,” he said in a prepared statement. The contract was won in a competitive bid by Babcock Canada Inc., a subsidiary of the British multinational firm Babcock International Group PLC. Babcock International won the original contract in 2008 after it teamed up with Weir Canada Inc. of Mississauga, Ont., to create a consortium called the Canadian Submarine Management Group. However, Babcock announced in 2011 that CSMG would be renamed Babcock Canada Inc. after Weir’s share of the joint venture was transferred to Babcock. The original contract award caused a political flap because Babcock beat out Irving Shipbuilding, which wanted to keep the repair work in Halifax. One of the critics was Green party leader Elizabeth May, who at the time was planning her run against Defence Minister Peter MacKay in his Nova Scotia riding. May, who accused the government of an “anti-Atlantic bias,” is now the MP for the Vancouver Island riding of Saanich-Gulf Islands. The original five-year contract in 2008 was worth $370 million over five years, but if CSMG met performance targets the contract was to be extended over 15 years, for a total value of up to $1.5 billion. Thursday’s announcement gives a clear indication that Babcock has met those targets. The fleet of four Victoria-class diesel-electric submarines has had a rocky history after the Liberal government made what appeared to be the bargain-basement purchase of the mothballed subs from the Royal Navy for $750 million in 1998. It took far longer and was costlier than expected to make the vessels seaworthy, and in 2004 the HMCS suffered a fire that left one officer dead. In 2011, HMCS Corner Brook ran aground near Vancouver Island during manoeuvres. There are now two subs, HMCS Victoria and HMCS Windsor, that are fully operational. HMCS Chicoutimi is currently being serviced at Esquimalt but is expected to be ready for sea trials later this year. The HMCS Corner Brook is also in Esquimalt for both repairs and a refit. The fleet is “at the highest state of readiness that they’ve ever been,” the source said. 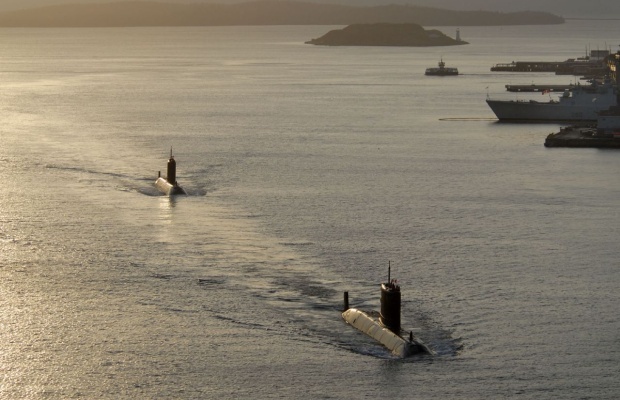 This entry was posted in The world's submarines and tagged Canada, HMCS Cornerbrook, HMCS Windsor, Submarine, Victoria class on July 4, 2013 by jasonlockley.